This coming Sunday, January 30th, I will be participating in a fiction reading at the Cornelia Street Cafe in the West Village. 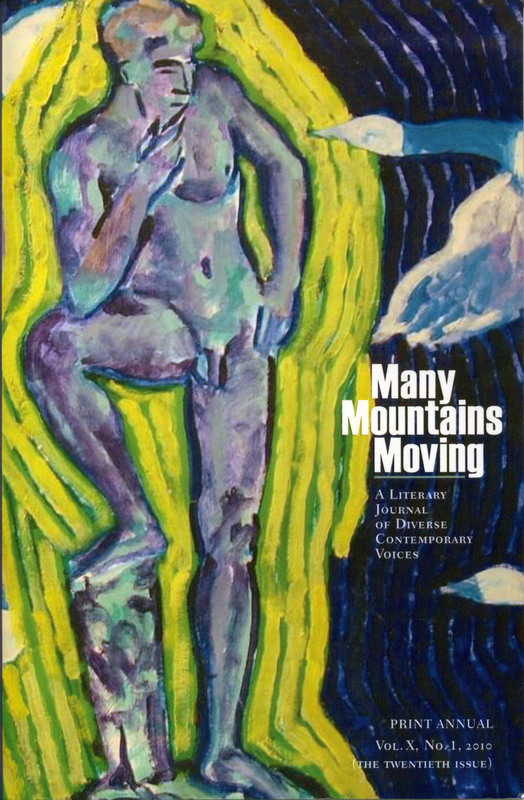 Please join Thaddeaus Rutkowski and Jeff Lee (co-hosts) at Cornelia Street Café, 29 Cornelia Street, on Sunday, Jan. 30, at 6 p.m. for selected readings from Many Mountains Moving. There will be six readers: Erik Ipsen, Minter Krotzer, Mindy Lewis, R.C. Ringer, Renato Rosaldo and Hal Sirowitz. The reading, which takes place in the performance space downstairs, begins promptly at 6 p.m. and will end before 8 p.m.; doors open at 5:45, $7 cover includes 1 drink. For those who would like to eat dinner afterward, Cornelia Street Café, at street level, is an excellent restaurant. The purpose of Narrative Marketing — as we practice it through narrative branding(R) — is to close the distance between a person and a brand, through use of narrative techniques including storytelling and metaphors. Narrative is transforming other areas of our lives, in ways profound and fundamental. One is medicine — Narrative Medicine. I had the most fortunate coincidence on Monday to witness, to participate in an information session about Columbia University’s MS program in Narrative Medicine. And ad about it in the New Yorker caught my eye at 3 pm, by 4 pm I had signed up online and at 6 pm I was on campus to learn, “what the heck is narrative medicine”? This initiative is lead by the fabulous Rita Charon, MD, PhD. She has recognized the role that narrative plays in closing the distance between patient and physician; between physician and physician; between family and physician. Dr. Charon coined the phrase Narrative Medicine back in 2000. She’s written extensively about this, including an article in the JAMA October 17, 2001, Vol 286, No 15. And it has been written up in many publications such as the NY Times. It is tremendously exciting to see how the power of narrative, and narrative interpretation, is shaping the most advanced fields of science and medicine. A story has the power to change the very course of a person’s life. Is social media recklessly ruining brand reputations? Any brand can get into trouble, often for reasons completely out of the blue. The question is not “if” but “when”. Nobody wants to be a case study like Tropicana or Gap’s logo recall. This coming Thursday, learn how JetBlue dealt with the fall-out from their flight attendant, Steven Slater, going awol down an emergency slide. How did they handle the immediate attention of all media, all over the world? Was twitter a lifesaver or a sore point? Erich Joachimsthaler will present new research on Social Currency. Can it provide some protection to brands when a crisis hits? And the incomparable Kirk Stewart will give us the new rules for handling brand crises in the world of social media. Sign up now at nyama.org. If you aren’t yet a member of the NYAMA, then use the code VIPBRAND for a special discount for readers of this blog. It pays to know the code! Mark the date on your calendar. January 20th. 6 to 8 pm. Or better yet, go to NYAMA.org and sign up! Join me when 3 terrific marketers share their experiences managing brand reputation in the age of social media. I’ll be the emcee of the evening’s event. Any brand can find itself tossed about in the sea of social media. Just look at Starbucks in last week’s New York Times (see my previous blog post). Or Gap. Or Tropicana. You don’t have to have a BP or Toyota sized problem to find your brand being tweaked on twitter. We’ll have a lively conversation about some very high profile branding events, with first hand reports from Kirk, Jenny and Erich. Kirk is on the front line of brand reputation in his role at APCO. Before joining APCO he was at Nike, dealing with brand crises ranging from protests over child labor to star athletes getting into trouble — Tiger Woods type of trouble. Perhaps we can convince Jenny to tell us the inside story of what kind of chaos was created last August when a flight attendant, Steven Slater, made his dramatic exit down the slide from a JetBlue plane. Erich will share insights into Social Currency, based on Vivaldi’s new study. You might have seen it written up in Fast Company a few months ago. And I’ve been told that there will be complementary copies of Erich’s Hidden in Plain Sight. The book won the AMA/Berry Prize, among other honors. So, sign up at nyama.org and come join us on January 20th. This is being held at the Ney Center at Y&R (285 Madison Avenue). Best to sign-up in advance, since there is limited seating. The doors open at 6 pm for networking and refreshments. The main event begins promptly at 6:30 pm. Starbucks…Rand…Thibodeau – or – A Tempest in a Tea Pot? The decision set off a wave of criticism from designers, much like the Gap logo fiasco last year. Gap unveiled a new logo so bland that the companywas bombarded with complaints and scrapped it. Why does such a small change create such alarm? Fear of change may have something to do with it. Trademarks and logos are so integrally linked to our daily lives that any tinkering with the familiar is suspect — and to be avoided. 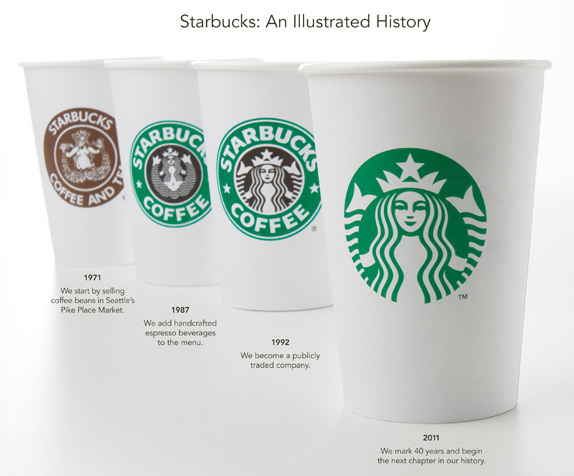 It seems like a rather overblown reaction to the change that Starbucks is making. Heller then goes on to quote Paul Rand about creating and updating logos. Rand was the person responsible for the IBM, Enron and UPS logos, among others. So who is right, Starbucks or the critics? And what is all the fuss about? This.